Vogue Buffalo Plaid Christmas Bags 25-Pk 16x6x12-1/2"
Vouge size Buffalo Plaid Christmas Paper Shopping Bags by the 25-Pack. These bags are made from a minimum of 40% post-consumer waste recycled gloss clay coat paper. 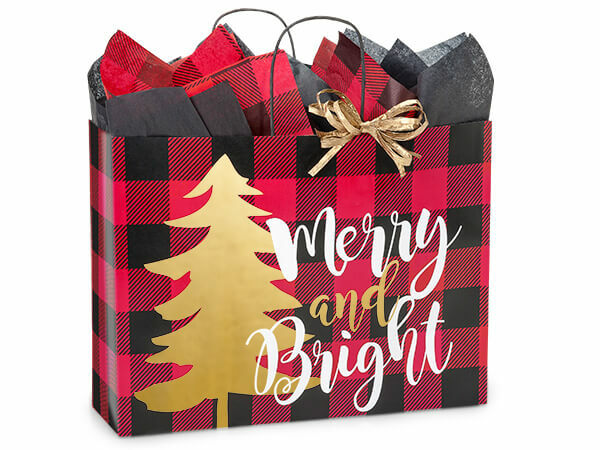 Buffalo Plaid Christmas shopping bags are made from recycled white gloss paper and have metallic gold accents. Bags are 100% recyclable, made with a minimum of 40% post consumer recycled content and carry the Green Way® logo. Made in the USA and individually UPC coded for easy resale. Shop Nashville Wraps for exclusive Christmas Gift Bags for holiday gift wrapping!